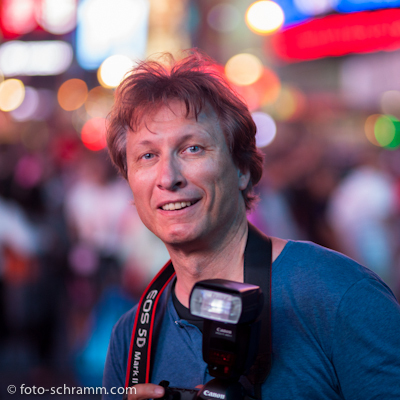 Norbert Schramm, a former olympic figure skater and world medalist, is well known for his refreshing and dynamic style of professional photography. He is able to put his subjects at ease with his engaging fun personality and creativity. Originally from Germany, he is an expert in show business photography, having worked in the entertainment industry his whole life and traveled all over the world. As a former performer himself he knows best what it feels like to be in front of a camera. Living in New York City for a few years, he puts his photographic focus on a performers face to portray their personality. Today's media markets are full of reality and the emphasis therefore is on a natural look. He also works as a professional headshot photographer, where he prefers to work on location with natural light or his mobile studio to create images that capture a performer's personality to create an individual story. He worked with the leading German photo agency "Pressefoto Rauchensteiner" which specializes in sports and action photography. Having captured images many years as a sports photographer and for shows with low lights, he's able to freeze a memorable moment in split seconds with his professional photography equipment. From there he developed his own style as a photographer by taking spectacular action shots of actors, dancers, athletes and German celebrities. His portraits will portray the person with elements of their life, such as their work, interest, containing their working environment up to minimal or no surroundings in the background. Norbert Schramm is well known for his flexibility and ability to portray people in their work environment. He loves to meet new people with all their different personalities. Norbert combines creativity and business 'know how' for successful commercial images, he even has a degree in economics and public relations. During his time working in the media metro pole of Germany in Cologne, he gained a lot of experience as an art director as well as the chief executive of an advertising agency. Having worked in public relations he understands what types of shots will sell best and be successful. He has always been interested in professional photography and action. At age sixteen he already developed B&W pictures in his own dark room at home. Very soon he started experimenting with his photography equipment by capturing artistic people in natural light. Freezing the movements of athletes and performers at crucial moments also fascinated him. Therefore he developed the ability to anticipate the right moment to capture an exciting image or portrait, by having it already focused on the frame. Since 2002 he is working with digital photography. Before he came to Manhattan, New York City, he was based in Berlin, Germany and Buenos Aires, Argentina.